Transcription of a letter from the Amos Adams Lawrence Collection, Massachusetts Historical Society. Ephraim Nute, minister of the Lawrence Unitarian Church, wrote to Amos A. Lawrence in Massachusetts, regarding the subject of a college. 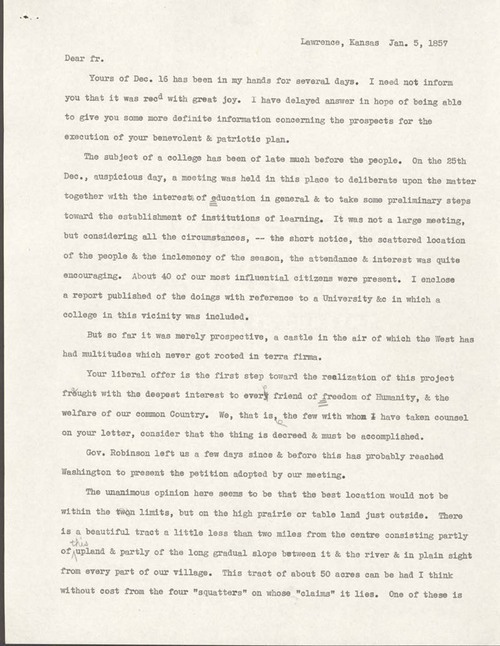 A well-attended town meeting had been held in which the idea had been discussed, though all seemed only "a castle in the air" but for Lawrence's "liberal offer" (presumably of funding) which was the "first step toward the realization of his project." The general opinion of the people was that the college should be constructed outside the town limits "on the high prairie or table land." Nute also mentioned the steps being taken to establish free public schools in the city, of upper and lower grades.